Snow Before You Go: Northern Rockies snow luck continues. The storm track favors the Northern Rockies for the best snow from Friday through Monday. Storms follow the jet stream off the Pacific and are then routed into the Cascades, Idaho, Montana and Wyoming. The storm track will end up so far north that Colorado, Utah and California get missed and stay mild. Out East, the jet stream will sink south allowing some light snow at the ski areas. I'm expecting some near misses by two Nor’easters but nothing direct. Northeast: The jet stream will setup in a way that forces most of the larger storms to miss the ski areas. That said, I am expecting a couple Alberta Clippers to brush the ski areas with some light snow between Friday and Monday. The closer you are to the Canadian border, the better off you'll be for potential light snow. 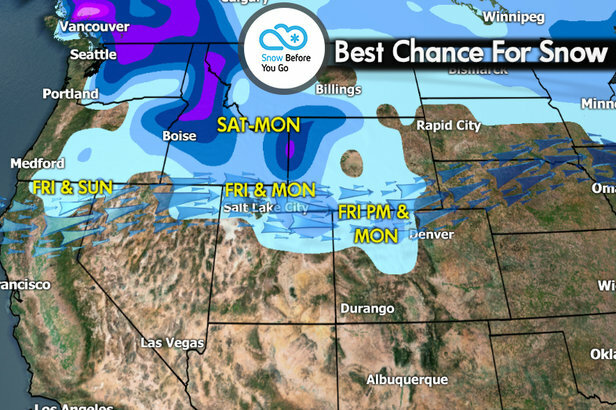 Rockies: The best snow will fall in Idaho, Montana and Wyoming between Friday and Monday. Colorado and Utah will largely get missed and stay mild. Grand Targhee, Jackson Hole, Schweitzer Mountain, Sun Valley, Red Lodge and Big Sky stand the best chance for new snow this weekend. But, I don't foresee blockbuster snow amounts, rather light accumulations spread out over three days. All of the Rockies turn drier and mild early next week followed by a return to snow late next week. California: The mild, dry pattern continues. The storm track just doesn't favor California. 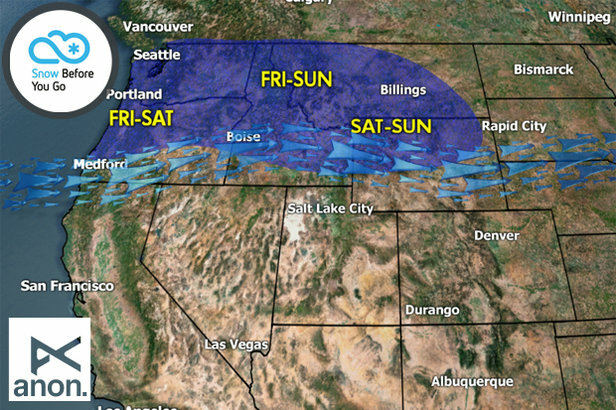 Storms will get ushered north into the Cascades between Friday and Monday. When will the pattern change? We could see a shift of the pattern by the middle of next week. Tomer's Take: For the best powder, ski Jay Peak on Friday, Schweitzer Mountain on Saturday, Jackson Hole on Sunday and Big Sky on Monday. Ski the Northern Rockies this week for two chances of new snow.